As President Obama closes out his presidential campaign on Monday with stops featuring A-List celebrities like rapper Jay-Z and rocker Bruce Springsteen, many of the victims of Hurricane Sandy are still waiting for federal, state and local assistance. Almost a week after Superstorm Sandy pummeled New York and New Jersey, scenes of increased desperation — residents wielding bows and arrows against possible looters, tempers flaring in long gasoline lines, and impassioned pleas to officials for help — are highlighting what has become an uneven recovery from the storm. In the immediate aftermath of the storm, President Obama flew to assess the situation with New Jersey Gov. Chris Christie. But with over 2 million New Jerseyans and New Yorkers still without power, gas lines snaking for miles and as many as 40,000 people displaced from their homes -- some are seeing Obama's visit as nothing more than a photo op. 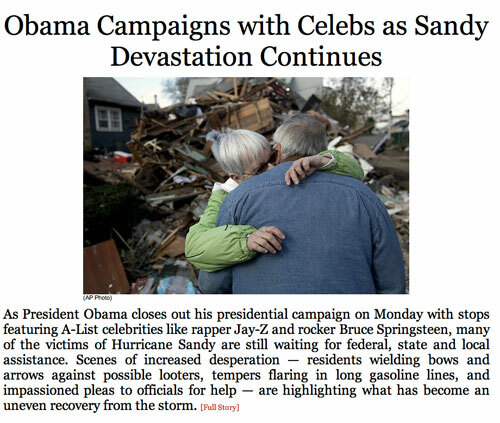 Funny thing, though: The above are the only references to Obama in the entire article, credited only to "Newsmax Wires" -- the rest is dedicated to the Sandy aftermath. That just shows what a deliberate cheap shot this article is.